This is one B and I have been making since we found it in our copy of the original edition of Ted Haigh’s Vintage Spirits and Forgotten Cocktails. On a Christmas aside, we just got a copy of the new edition from B’s parents. It has several new interesting cocktails (stay tuned), an updated list of suppliers and a nice spiral binding that lies flat on the counter. Definitely a nice addition to you cocktail library, especially if happen to have a set of generous parents on hand. Anyway, back the cocktail. According to Ted Haig, who gives original credit for the cocktail to The Official Mixer’s Manual by Patrick Gavin Duffy (ca. 1934), the original version called for grenadine. Apparently raspberry syrup was an innovation by the good Dr. Cocktail., which he claims was a common substitution of and after which he “never looked back”. Being a scientist, I tried it both ways, including some very nice pomegranate grenadines, and I concur that the raspberry syrup is an improvement. It’s interesting that Vintage Spirits and Forgotten Cocktails is the only book in my library that has this recipe in it. Give it all a nice shake in a cocktail shaker full of ice and strain into a chilled cocktail glass and garnish with a twist of lemon. I keep tinkering with the Blinker. 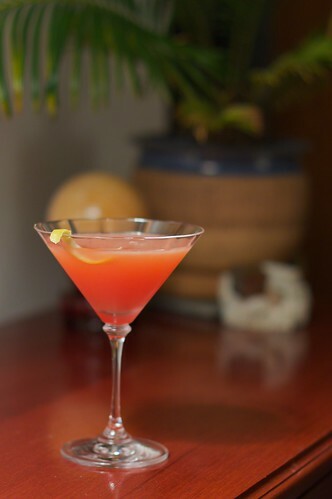 Originally, I used carton grapefruit juice and Torani raspberry syrup. This time is used fresh squeezed grapefruit juice, and it was a definite improvement. I think next time I will try it with a more interesting raspberry syrup (either making it or using one based on whole raspberries). I’lll keep you posted as to the results. B & I wish you a happy new year. Cheers. Thanks for the recipe. Next time a have a grapefruit, I’ll have to give it a try. Any idea about lifespan in the fridge? I know simple syrup only lasts a month or so before getting fuzzy. I was actually thinking I could freeze teaspoon size aliquots (sorry, they scientist geekery tends to leak out). I figure you could and them to the rye and grapefruit juice before adding the ice and it would melt quickly. This would get around the fridge life problem. PS You mentioned Jerry Thomas’s book for your Knickerbocker recipe. I don’t know you have run across David Wondrich’s (of Esquire fame) version called Imbibe. He basically take Thomas’s book and provides more detailed commentary and more specific (and often more modern drier) quantities on drink recipes. If you add the ounce vodka to each 12-16 oz bottle of syrup, it helps along with the sugar to preserve the syrup. Syrups this way can last over a year. And yes, I have both The Bon-vivant’s Companion and Imbibe!